1. The Leading Group on Innovative Financing for Development held the 8th Plenary Meeting on 16-17 December, under Japan’s presidency. 2. This Plenary session was the occasion for a number of new countries to participate for the first time, which marks the growing interest by the international community to the work achieved yet by the Leading Group. 3. We are five years away from the 2015 deadline for achieving the Millennium Development Goals (MDGs). Although the international community has been actively engaged in international cooperation, the world is still facing the severe reality in which many people suffer from starvation, diseases, climate change and other global challenges, and are unable to live in dignity. 4. In order to meet the MDGs and other challenges related to sustainable development, we need to explore innovative financing which is stable, predictable and additional to the existing resources, tapping into various mechanisms including, as appropriate, mandatory contributions, voluntary contributions, loan guarantees, debt swaps, market mechanisms and private sector investments. 5. We originally recognized the value of exploring innovative sources of financing at the International Conference on Financing for Development in Monterrey in 2002, and we thereafter discussed innovative financing at the Doha International Review Conference on Financing for Development. This year, an informal debate was held at the UN on 3 June, and we held the high-level side event on innovative financing on 21 September during the MDGs Summit in New York. We now witness a growing interest among the international community in discussing innovative financing. 6. We support the growing attention on the UN agenda for innovative financing for development. The MDG’s Summit outcome document and the new resolution adopted by the United Nations during the 65thsession of the General Assembly are crucial steps in that regard. We also welcome the inclusion of Development in the G20 agenda. 7. We have endeavoured to deepen understanding on innovative financing among a wide range of countries and international organizations. 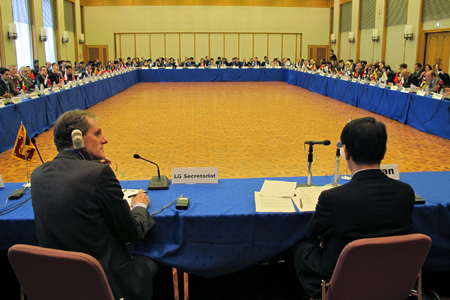 A number of countries joined the Leading Group including Bhutan, Ecuador and Sri Lanka from this meeting. This means that the consideration on innovative financing has become an important agenda that attracts much interest from the international community. 8. At this meeting, we took note of the significant impact of innovative financing in the health sector including IFFIm, AMC, the air Ticket levy, and private sector initiatives. New ideas were also introduced like a Tobacco tax and new public-private partnerships. These presentations highlighted the remarkable results achieved in the sector, and proved the added value of such mechanisms. The setting up of a dedicated Task force has been put for consideration. 9. We highlighted the sector of education as a priority for innovative financing and welcomed the expert report presented to the Task Force on Innovative Financing for Education. We asked the Task force for further elaboration of the proposals of the Report. 10. Regarding innovative financing on international financial transactions for development, a financial transactions tax for development was discussed on the basis of the Expert Report set up by the Task force on international financial transactions for Development. The Declaration presented and supported by Japan, France, Belgium, Spain, Norway and Brazil at the MDGs summit side event was marked as a positive posture for future action. 11. Besides that, we acknowledged the negative impact of illicit flows to development and welcomed progress made over the last few years. Following the report made by the Task force on illicit flows and Tax evasion under Norway’s direction, transparency and sharing of information is a key issue for the Leading group and a lot more must be done. 12. Following our common work on innovative financing for Climate change and the side-event organized on the margins of the Copenhagen Summit, we have shared experience on existing initiatives like the proceeds of CO2 emissions trading and looked forward on creating new initiatives. We have also discussed the report of the High level Advisory Group on Climate Change financing submitted to the UN Secretary General. 13. We reconfirmed the necessity of reducing the cost of migrants’ remittances, and the improvement of their impact on development in recipient countries, including through microcredit institutions. 14. We also recognized the work carried out by the Group with the objective of identifying innovative sources of financing to combat hunger and poverty. 15. For the way forward, we support a scaling up of initiatives and concrete actions. We will work within the UN to foster the follow up of the UN resolution on Innovative financing for Development. We will in particular put a special emphasis of the LDC’s. On that regard, it was proposed that we would meet in the occasion of the LDC meeting for a High level side-event in Istanbul in May 2011.G20 should give due attention to the potential of innovative financing in its development agenda. 16. We ask the Permanent Secretariat to launch a study on how to encourage private sector involvement on a voluntary basis, as well as an objective assessment of economic sectors which have benefited the most from globalization and their contribution to development, and to report on these bases for our next meeting. 17. At the last, we confirmed that Mali would succeed Japan as the President of the Leading Group on January 1st next year. Spain will run the Presidency during the second semester of 2011.